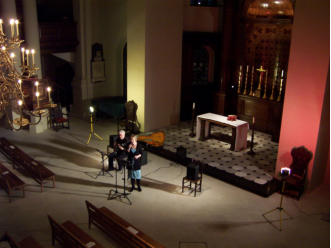 St George’s Bloomsbury is a wonderful and expanding arts and concerts venue situated in the edge of London’s West End. We are available for hire daytimes or evenings from Monday - Saturday. We are always pleased to hear from performers and ensembles who might be interested in giving performances in the church. Because of its resonant acoustic the church is best suited to smaller scale musical performances with a maximum number of around 30 performers. The building and acoustics currently severely limit the kind of theatre productions we can stage; however smaller and more intimate productions may be considered. Full venue information can be found on our Venue & Hiring - Facilities page. For concert and theatre bookings, or further information on hiring St George’s Church Bloomsbury for performances, please contact Mark Summerbell, our Arts & Concerts Director, here.